Now before you accuse Playgoer of being a Neil Simon fan, hear me out. 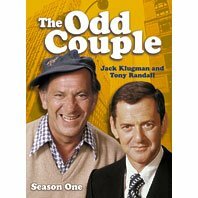 The tv series of The Odd Couple remains one of the best shows ever, and Tony Randall's sustained performance over five seasons a masterpiece of silliness. Jack Klugman ain't bad either. Fans of the show have been waiting years for an official DVD release. (It was never even available on VHS--except on my own disintegrating EP-speed tapes!) Well now that moment has come. Or will come on August 14, the release of the first season, but you can pre-order here. Now I'll be straight with you: Season One is the weakest one. It's on film with a laugh-track, the actors are still finding their roles, and the whole thing is just apeing the Lemmon-Matthau movie more or less, without the same results.... So you may want to wait till Season Two, when Exec. Prod. Garry Marshall (yes, that Garry Marshall, but pre-"Happy Days," and pre-"Pretty Woman") switched to a 3-camera/live audience format and let his stars really run with it. Yes, at best, it's boulevard comedy. But by today's standards, its finely observed theatre. And the acting (and some of the writing) truly elevates the material to satisfying social comedy. (Not to mention delicious satire of early-70s cosmopolitan life.) And what show since has taken two mature protagonists (the actors were in their 50s by the end) in an urban setting, with jobs, no less.